The summer of 2018 was a challenging time in my life. Stretched thin with endless hours of work and studying, I found myself counting down the days until my week off in August. I had originally planned to spend this precious time sleeping on the couch, but my partner- who perhaps knew I needed a getaway more than I did- surprised me by booking a two-night stay just outside town at a place mysteriously known as “The Barn”. We had heard about it through a family member and decided this was something we needed to experience for ourselves. So, we packed our bags, hit the Southern Shore road, and drove until we hit the sparkling waters of Bauline East. I never cease to be amazed by the Irish Loop. In a matter of minutes, you can exit the bustle of town and exhale deeply into the rich expanse of land, ocean, friendly people, and occasional farm animals. The tensions you didn’t know were inside of you begin to relax when you hit this road. I had a feeling, as we drove towards the unknown, that we were heading for something beautiful, but nothing could have quite prepared me for what awaited us. The Bauline compound (L-R): Bunky, Barn, Cabin, Teepee, and the Main House. The Barn is one of three cabins, all on the same property, owned by a couple named George and Chabela. Originally from Wyoming, these two moved to Ontario 22 years ago. While visiting a friend in Newfoundland, Chabela fell in love with this property and purchased it without even seeing the inside. They brought their life to this province, made the property their home, raised a family there, and eventually turned the land into the accommodations they are today: The Barn, the Cabin, The Bunky, and the Teepee. 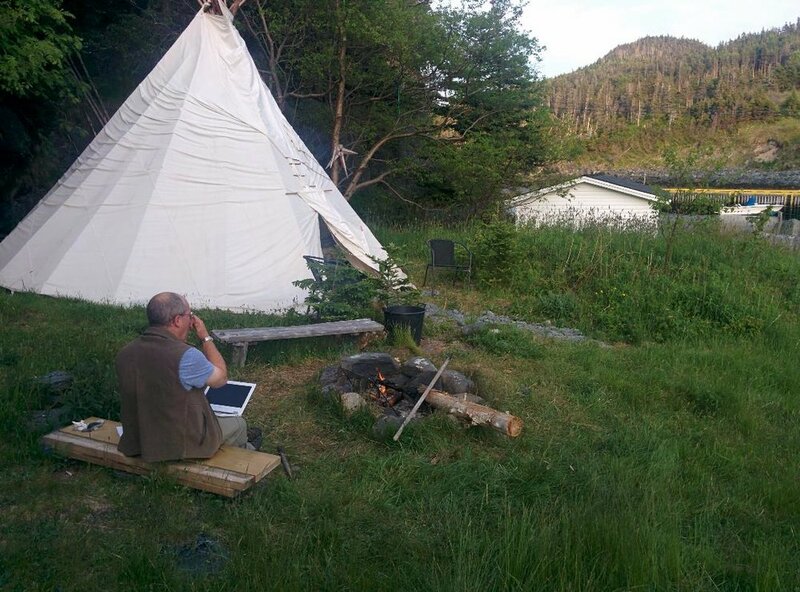 George sits at a campfire near the Teepee on a summer’s night. Since then, they have hosted travellers from all over the world who are drawn to the unique lodgings, the friendly community, and the beachside location ideal for whale watching, puffin patrol, and hiking on the East Coast Trail. George said the most rewarding part of this work is the opportunity to connect with such a diversity of travellers. A picture from our hike on the nearby Lamanche trail. These hospitable hosts have seen their share of fascinating people over the years. They have no shortage of stories depicting their encounters with folks from all walks of life. A colony of seagulls seen from the docks of the Bauline Compound. And for me, a burnt-out student who simply needed some fresh salt air, the experience was nothing short of magical. Maybe it was the warm muffins and coffee that George and Chabela set out for our arrival- or the fact that, with a strong breeze, we could feel the wind slightly ripple through our cozy Barn at night. It might have been the friendly dog who stopped by while we ate dinner on the beach and sipped coolers, watching the sun set over Bauline East. Whatever it was, I found solace in this place, and will never quite forget the feeling it left in me. The Little Barn on the Beach is a reflection of its owners- of passionate, creative people who have enriched our province with their presence. Their property is a labour of love- a love that shines through in every nook, every crevice, and every breeze that rustles your sheets. The sunset over Bauline East. 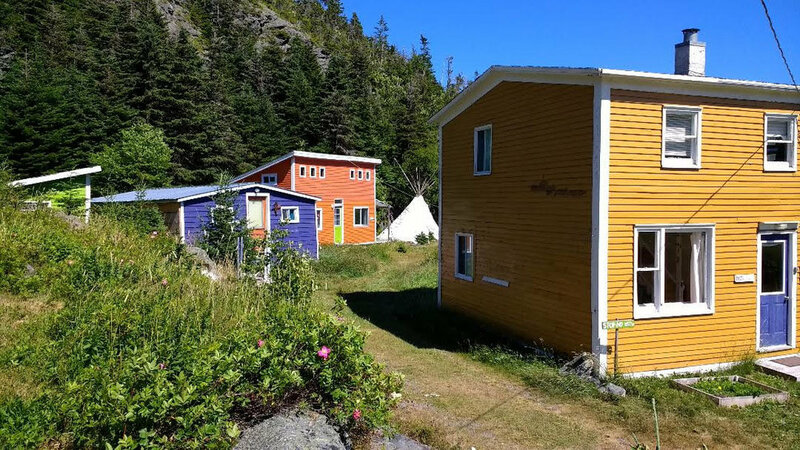 George and Chabela’s properties can be found on Airbnb under East Coast Newfoundland Barn, Cabin, Bunky, and Teepee, respectively. Trips can also be booked at Booking.com under “East Coast Newfoundland Cottage & Cabins.” They open for the season in June.